I really need to provide some context for this. Kimberly Synder’s Beauty Detox Solution works in three phases, spread out over a month or more each. It’s actually designed really well for people coming off an omnivore diet or with some specific health concerns, i.e., candida. That being said, on Sunday I thought I’d skip the first phase which starts with a food-based breakfast, and go straight to the green smoothie breakfast figuring I had been 100% raw before and it should be a breeze. Turns out that I don’t really (read, ‘at all’) like the Glowing Green Smoothie recipe that is the foundation for Phase 2, and really Kim’s whole proposition. Not my cup of tea at all people, sorry. So after the ‘how do I chug down 32 ozs of green goop that I don’t like the taste of’ saga of Monday morning that left me feeling totally deflated, I thought I’d go back to Phase 1 for breakfast. So, being resourceful, I swapped bananas for avocados, added some dates for sweetness, and some vanilla powder for a little somethin’-somethin’ and I was all set with a delicious (and not green) breakfast! 2 medjool dates, soaked over night to help with the blending – remember to keep the soaking water for a smoothie or nut milk! In all honesty, this was a worthy alternative to the cooked, gluten-free oatmeal I have been having recently and it has all the nutritional power of RAW! It does need to be said, however, that fruit is not recommended in this phase of the detox! So, if you’re detoxing or on a low-sugar diet, keep this in mind. 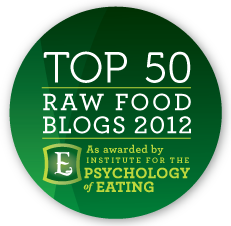 If you’re a happy-go-lucky raw foodie, go for it! * Please note that oat groats are considered ‘gluten-free’ but some celiacs still have issues with them so be careful. Also, most oats groats are not raw, even if they are advertised as raw. Oats groats are probably not raw. Most oats have been steamed for some reason. If they don’t sprout, they aren’t raw. I found a great way to eliminate the overnight thing. I do the following and they turn out perfect. Two to one (water to oats), salt if you wish, bring to boil, reduce heat and simmer covered for half an hour or so. Sounds like a great idea, thanks for sharing! Good for those who aren’t 100% raw.